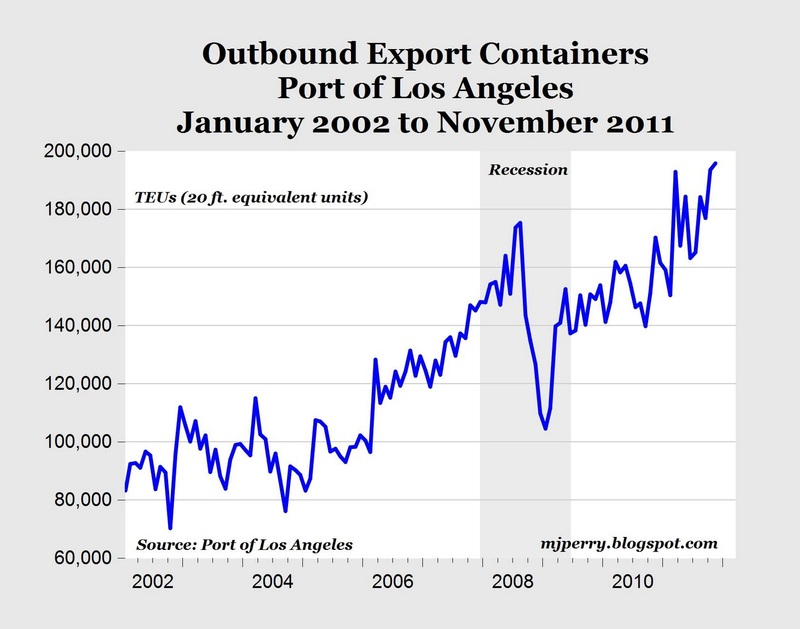 The number of loaded export containers leaving the Los Angeles Port in November for overseas destinations reached a record high of 195,877 TEUs (20-foot equivalent units), beating the previous record of 193,547 TEUs in October (see chart above). November exports this year are running 15% ahead of the same month last year, and above the previous month by 1.2%. Loaded import containers in October were 6.2% above the year earlier level. Bottom Line: Global demand for U.S. exports shipped from America's busiest container seaport has never been higher than last month, reflecting the ongoing worldwide economic growth. Scott Grannis posted about this earlier today and shows graphically that monthly container exports from Los Angeles correlate very closely over time with total U.S. exports, but are released about a month earlier than international trade data from the BEA. In about a month when the next trade data are released, we can look for a strong increase in November merchandise exports from the U.S.
"The number of loaded export containers leaving the Los Angeles Port in November for overseas destinations reached a record high"
We can give much of the credit for stronger US exports to Ben Bernanke and the weaker dollar. The "weak" dollar makes for a "strong" economy! Who are these morons always prattling on about a "strong dollar"? "Long Beach’s volume year-to-date (through November), without factoring in CUT’s business (which moved to LA and so inflated reported container movements there), show imports down 3.3 percent, exports down 4.1 percent and total container volume down 3.5 percent."